2016 Lowe SF194 Sport Fish Superior handling and easy-to-use angling features make the Sport Fish 194 the top entry-level fishing pontoon boat for active families. From the stern rod rack to the pedestal fishing seats and every inch of comfy lounge seating in between, this pontoon delivers huge fishability and fun at an unbeatable value. 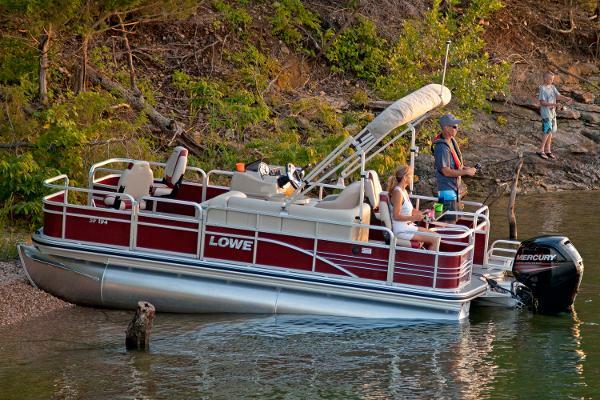 Discover the joy of getting into a new Lowe pontoon boat that’s as perfectly equipped for anglers to take their fishing buddies out as it is for spending weekends on the water with the family. Please note: This boat model may or may not be in-stock. A Nationally Advertised Price, if listed, may change without notice or include accessories not fully described herein. Please contact your local, authorized dealer for exact details on model availability and package pricing. 2017 Lowe SF194 Sport Fish THIS BOAT IS BLUE IN COLOR WITH SAND INTERIOR AND FULL VINYL FLOORING. KHAKI BIMINI TOP AND FULL MOORING COVER. FEATURES: A QUIET AND FUEL EFFICIENT MERCURY 40ELPT EFI ENGINE TILT STEERING WHEEL DROP DOWN PRIVACY ROOM RECLINING CAPTAINS SEAT CHROME PACKAGE Superior handling and easy-to-use angling features make the Sport Fish 194 the top entry-level fishing pontoon boat for active families. From the stern rod rack to the pedestal fishing seats and every inch of comfy lounge seating in between, this pontoon delivers huge fishability and fun at an unbeatable value. 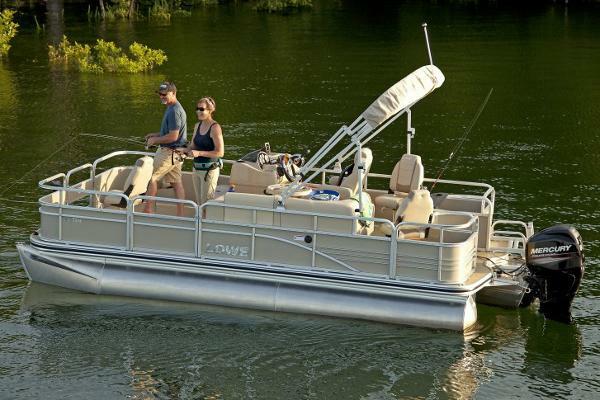 Discover the joy of getting into a new Lowe pontoon boat thats as perfectly equipped for anglers to take their fishing buddies out as it is for spending weekends on the water with the family. Please note: This boat model may or may not be in-stock. A Nationally Advertised Price, if listed, may change without notice or include accessories not fully described herein. Please contact your local, authorized dealer for exact details on model availability and package pricing. 2017 Lowe SF194 Sport Fish 2017 Lowe SF194, Red Fence w/Sand Decaf/Cafe Furniture, Mercury 60 HP ELPT CT 4-Stroke Outboard Motor, Trailer, Tilt Steering, Aft Round Table, Bimini Top Khaki, Full Cover, Full Vinyl Floor Tan, Docking Lights. HIN: LWC01603I617. Pictures are representative. More to follow. This unit is offered subject to prior sale, price change, or withdrawal without notice. General Description: Superior handling and easy-to-use angling features make the Sport Fish 194 the top entry-level fishing pontoon boat for active families. From the stern rod rack to the pedestal fishing seats and every inch of comfy lounge seating in between, this pontoon delivers huge fishability and fun at an unbeatable value. 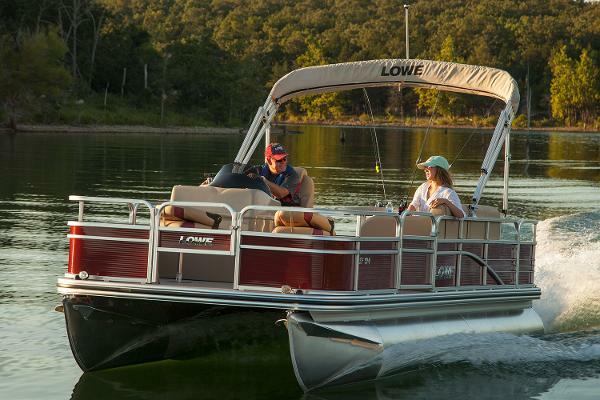 Discover the joy of getting into a new Lowe pontoon boat that’s as perfectly equipped for anglers to take their fishing buddies out as it is for spending weekends on the water with the family. Please note: This boat model may or may not be in-stock. A Nationally Advertised Price, if listed, may change without notice or include accessories not fully described herein. Please contact your local, authorized dealer for exact details on model availability and package pricing. 2017 Lowe SF194 Sport Fish Additional Options: Docking Lights, Drop Down Privacy Curtain, Full Vinyl Flooring, Custom Fit Snap On Cover, Ski Tow Bar, XL Tritoon Package, Tilt Steering Color: Blue Superior handling and easy-to-use angling features make the SF 194 a terrific entry-level fishing pontoon for active families. From the stern rod rack to the pedestal fishing seats and every inch of comfy lounge seating in between, this pontoon delivers fishability and fun. Features include: 25” diameter high-buoyancy pontoon logs w/ full-width cross members and full keelCapacity for 10 family members or fishing buddiesFiberglass reinforced acrylic console w/ tach, speed, fuel & trim gaugesBarrel helm seat w/ swivel & slider4 pedestal fishing seats, bow and aftJensen® MS30 Bluetooth-ready AM/FM stereo w/ speakers13-gallon aerated livewell located in the bow area3 angled stern rod holders with cup holdersRound pedestal table w/ 2 cup holdersStern entry w/ heavy-duty boarding ladderHeavy-duty 9' Bimini top in choice of 3 colorsOPTIONAL FISHING FEATURES: MotorGuide® or MinnKota™ trolling motor; Lowrance Elite or Mark-5x fishfinderPower by Mercury outboards, Ray electric or Torqeedo Electric outboards. Lowe factory packaged boats are available with various horsepower Mercury® outboards. Standard equipment and options may vary from model to model. 2015 Lowe SF194 Sport Fish This boat model may or may not be in-stock. Please contact your local, authorized dealer for more information Superior handling and easy-to-use angling features make the SF 194 a terrific entry-level fishing pontoon for active families. From the stern rod rack to the pedestal fishing seats and every inch of comfy lounge seating in between, this pontoon delivers fishability and fun. Features include: 25” diameter high-buoyancy pontoon logs w/ full-width cross members and full keelCapacity for 10 family members or fishing buddiesFiberglass reinforced acrylic console w/ tach, speed, fuel & trim gaugesBarrel helm seat w/ swivel & slider4 pedestal fishing seats, bow and aftJensen® MS30 Bluetooth-ready AM/FM stereo w/ speakers13-gallon aerated livewell located in the bow area3 angled stern rod holders with cup holdersRound pedestal table w/ 2 cup holdersStern entry w/ heavy-duty boarding ladderHeavy-duty 9' Bimini top in choice of 3 colorsOPTIONAL FISHING FEATURES: MotorGuide® or MinnKota™ trolling motor; Lowrance Elite or Mark-5x fishfinder Lowe factory packaged boats are available with various horsepower Mercury® outboards. Standard equipment and options may vary from model to model.